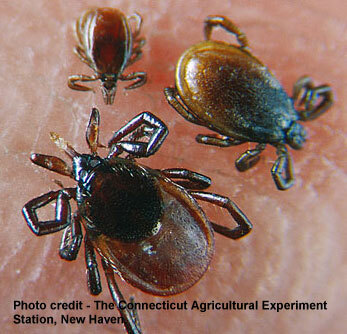 The unusually mild winter has created an increase in the tick population. WYBSL would like to share the following information to its members to help you protect your family so that you can enjoy a healthy baseball/softball season. What does the warm weather mean for the tick threat? "One would expect to see them earlier this year, but in theory there won't be more ticks than usual," Barton says. "However, given the warm weather, people will be outdoors more frequently and therefore more often exposed to ticks, and the number of opportunities for infection is more important than the number of ticks." How will I know if I have been bitten by a tick? "Ticks have some sort of anesthetic in their spit, so you are not going to feel it when it bites you," Barton says. "That means you have to check yourself thoroughly. They can be hard to spot. Nymphs, which are the size of a poppy seed, spread the most infection to humans because they are harder to spot and less picky about what they eat -- they are teenagers, desperate and hungry -- while larger adult ticks tend to favor smaller mammals." What should I do if I find a tick on me? "First, it's not a medical emergency, so you don't need to dial 911," Barton says. "In most cases, ticks take an hour or so to crawl somewhere dark and warm -- the back of your knee, your groin -- and start feeding. If it hasn't settled in to feed, you can brush it off. If it is already feeding, it takes more than a day to pass along any infection it might be carrying." "To remove it, use fine-tipped tweezers to grasp the tick close to the skin and pull up with even pressure without twisting or jerking the tick. Don't use your fingers -- they are crude tools, and they can squish the tick, which can then squirt their guts, which is what carries infection, into you. If some of the tick pieces get left behind, that's OK. You will do more harm than good to dig into your skin to look for leftovers. Your body will heal fine even if a little bit of the tick is left in you." "Don't use Vaseline, matches, or alcohol -- none of these things work or help." I've removed the tick that was feeding on me. What should I do now? "The overall risk of getting Lyme disease from a feeding tick is 3.2%, so your chances of getting sick are pretty low," Barton says. "But you won't be able to tell from the tick if it is infected. If it has had a chance to feed on you, it's important to check with your doctor. The bacteria is extremely hard to grow in a lab, so instead of looking for the germ, we look at the body's response. If a red blotch that's not accompanied by fever or itching develops in the area where you were bitten -- usually after seven to 10 days -- we treat with antibiotics." My dog likes to join me in the great outdoors. What should I do if I find a tick on her? "Pets such as dogs are hard to check, but if there's a tick on your dog, it won't get hungry again soon once it has fed. It won't be looking to hop onto you. Removal for pets is the same as for people," Barton says. What can be done to protect myself from ticks? "You can best prevent exposure by not going outside, but that's not a good idea -- you should enjoy yourself," Barton says. "And while tucking long pants into your socks can keep ticks off your legs, in hot areas that is not very comfortable. I recommend using a DEET-based insect repellent to spray a ring around your thighs. This creates a barrier that will keep ticks from crawling up into your shorts, areas that are hard to search for ticks and where we find as many as 50% of feeding ticks."